Fruit Kitchens No.13: Cherry Pink - FunkyLand FunkyLand FunkyLand. It is the Marcia Brady of the escape family: its popularity seemingly so effortless, simple yet stylish, unshakably cheerful and even rather flirtatious. Yes, the analogy fits. Because we can't help liking anything that comes from FunkyLand, even if it's a bit predictable. There are times when FunkyLand takes center stage with clever presentation and creatively tricky codes to solve, but this isn't one of those times: just a repetition of tasks and puzzles you've probably seen in other games several times before. Still, Cherry Pink is too pretty to ignore and too whimsical to care much about displaying I.Q. points or stimulating repartee. Escape from Umino Room - Or otherwise known as "Ocean Escape" depending on how your browser's translator is set-up. Eschewing the traditional play button, Amakuchi Game ushers you inside this sea-inspired room when you click on the little blue fish swimming across the title screen. As unassumingly cute it may first appear to be, this little creation will do its best trying to stump you with less-than-overt clues and a ghost leg puzzle might prove frustrating to those of us who still haven't worked out the logic behind that particular form of puzzle. The author writes that some clues have been revised, hopefully improving their logic, but it's not always so straight-forward. Even so, there's something pleasantly charming and curiously engaging about the presentation; it's hard to stop once you begin. This should be a good one for our community to work out together, so I'll turn the rest of the commentary over to you: thoughts? RRU Escape 3 - Sneedle's artistic talent lies in an intriguing ability to communicate so much even without words. It's not fully articulated why this room is so supernaturally-inclined, and the ways in which some clues work can be equally preternatural, but that only adds to the overall mystic aura. That's all part of why the game is entertaining. The biggest hang-up you might run into, though, comes before the game begins—some of you might encounter an unusually long-playing video ad. The way around it is to click the "skip" bar in the bottom right corner of the ad (it's written in Japanese, but you'll notice two right arrows after the lettering). After that, it's pretty smooth sailing, with just a smattering of codes and only a few spooks to deal with. Weekday Escape N°49 Walkthrough now available! Take a closer look at the kitchen table. You'll find CHERRY #1 in the bowl of flowers. 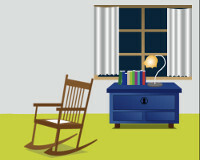 Check the low table under the window. Open the lid and upper compartment of the container on the right end of the table to find CHERRY #2. There's something useful on the small table to the left of the kitchen counter. It's the CAN OPENER, next to the basket of bread. I bet you couldn't have taken that CAN OPENER if there wasn't a can around here somewhere to open with it. The can is on the kitchen counter. Open it and take CHERRY #3. The cabinets above the sink contain another useful tool. A pair of PLIERS can be found in the lower left of the left-hand cabinet. What's that odd-looking gizmo to the right of the stove? There are two colored dials here, but it looks like one is missing. Can you find it? There's a pink dial covering a compartment on the kitchen table, but it won't come loose. Use the PLIERS to take the PINK DIAL, as well as CHERRY #4, which was hidden beneath it. Insert the PINK DIAL into the frog device. 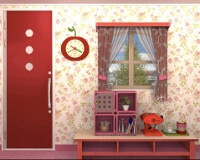 Have a look at the cherry-shaped clock next to the window. The colors of the hour, minute, and second hands match the colors of the dials! Move the dials to the positions indicated by the hands: pink at 10 o'clock, green at 4, red at 8. Click the "OK" button and take CHERRY #5. There's an interesting-looking panel to the left of the kitchen counter. Nine buttons, numbered 1 through 9. But in what order to press them? Maybe the clue is right in front of you? Press the buttons in descending order from 9 to 1, as indicated by the graphic below the panel. Take CHERRY #6 and the PINK KEY. The panel has changed to a drawing that seems to indicate a different order of button-pressing. Nothing happens when you try it, so it must need to be used someplace else. There's another 3-by-3 panel in the pink cupboard underneath the window. Use the PINK KEY to unlock the panel cover. Press the nine buttons in the order indicated by the other panel, and click to open the door and reveal CHERRY #7. You win! After loading, the game opens with a little blue fish swimming back and forth across the scree. Click on it to start the game. You are now in a room with 4 walls. Yellow lifesaver - zoom in to the box above it to see an up and down arrow head. We need the right combination. Orange octopus(?) facing right on a filing cabinet (?) - we need a 3-shape code for it to do something. Filing cabinet (locked) - we need a 3-image code to open it. A 3x3 grid of orange dots with all connected to the center dot. The top middle dot looks like the head of the octopus. It is facing left. A green boat with a box and white flag on it. Clicking on this, we see a similar 3x3 grid, no lines. All the dots are orange except for the bottom middle dot, which is black. This black dot also looks like an octopus head. This head faces right. There are three clickable grey circles below each column of dots. Clicking these changes the dots of a particular column to blue. We need the code for which dots should be blue. The entire wall shows a picture of a grey semicircular boat-like object apparently in the sea (there are waves). 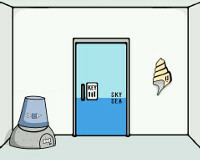 The sky is light blue and the sea is dark blue. There are three letters on this picture - r (sky), j (boat), m (sea). Overturned pail with a pic of a fish on it - click on the "180 degree" sign to flip the fish over. It appears to be made of 3 separate shapes. Hmmm. Pile of sand - click on the sand to show 3 boxes with the symbol of a key to the left of them. We need the colour combination for these boxes. Door - This is two-toned - the top is light blue and contains the word "SKY". The bottom is darker blue and contains the word "SEA", which makes sense. Also, there's a box with the word KEY on it. Click that to find 3 columns, mainly white, with some blue on the bottom. Clicking on the blue toggles the amount of blue in the column (1 - 5 blocks). We need the code for how much blue in each. Shell - click on this to find a vertical set of 3 colour boxes. We need the colour combination for these boxes as well. This is similar to the second wall, except the sky is orange, the boat is a different shape (although it looks like the exact inverse of the other one) and the letters are u (sky) and g & t (boat). Use the shape of the fish from the pail. The octopus squirts out a blue goo to cover some of the orange dots to the right. The blue goo covered 4 dots. These are the dots in the boat puzzle that we need to turn blue. However, we have to picture the dots as rotated 180 degrees so the octopus head is aligned correctly with the boat puzzle dots. top centre, centre centre, centre right, bottom left. There's a click and you're now facing the first wall again. Click on the boat again and the flag will move in a sequence, left or right. Note the sequence. Click on the box connected to the life saver. Click the up and down arrows in the sequence from the boat flag, then click the button below to open it. We need a 3-pic combination. Click on the lifesaver - solving the last puzzle gives us the hint we need. A little white creature is now wearing the lifesaver. Click on the lifesaver again to see the clue. We see the 3 boxes and four vertical lines (with cross lines) pointing down to the 4 available images in the filing cabinet boxes. Some intuition is involved here ... for each box, we need to trace down to the corresponding image - where we meet a cross line, we need to follow that across to the next vertical line. The filing cabinets opened and show 3 vertical drawers with the letters r, m and u going down. I think we've seen these letters somewhere before ... right??? Click on the shell to find a new clue - there's a pic of two pieces that seem to fit together, with one on it's side. Also, in the background, there are three letters - j, g, t.
This seems to indicate we need the colours for these letters. But they're all ship-coloured, which is grey ... and that's not an option. This is where the clue of the two pieces fitting together comes in. Recall that the two pics of the ship seem to be the inverse of each other. i.e. if you rotate one and place it on the other, they form a full circle. The "hills" on one fit perfectly in the "valleys" of the other. If we do this, j would end up in the sky of the fourth wall pic. Similarly, g would end up in the sea of the second wall pic, but t would be in the sky. The pile of sand has now yielded the final clue. A sheet of paper contains S, E, A and S, K, Y. Each letter is surrounded by a combination of blue squares, green dots and sketched fish. I really enjoyed all of these, but Umino Room was not very intuitive/clear in a lot of places. I never solved that life preserver puzzle, I had to brute force my way through that code (the one with the kelp, fish, turtle and shell). I read the walkthrough for it after, but I still don't get how to solve it. But I loved the art style! Nice bunch of escape games. The walkthrough and other sites mention the three letters j, g and t being in the background on the key picture. But I simply don't see them anywhere. All I see are the two halves, and the combined box. Could someone please screenshot where they are supposed to be? I could screenshot it, but if you're looking at the key picture with the two halves and the combined box, it wouldn't show you anything you're not already seeing. Maybe turn up your monitor contrast? There's a pattern of white and light gray underneath the black images that takes up the entire view. The letters are in gray, with a white outline. These presented a little more challenge this week. Have to agree that Umino, while nice looking wasn't an easy one to navigate in; however these were all still entertaining. A screenshot wouldn't be very helpful because it takes up the whole window. The letters are very large but very faint - I couldn't see them at first because my screen was at the wrong angle. If your contrast is too low, you won't be able to see them. It's a dumb flaw in an otherwise good little game.